In one of my previous posts (located here), I discussed the Unique Document ID feature that can be enabled on all document libraries within the site collection. In that post, I also mentioned that it was strange that the E-mail a Link button on the ribbon then still uses the actual url of the document, instead of the virtualized unique url of the document. Why would you have a unique url to a document that you cannot easily send? We need to accomplish several things to make all of this work. Add a button to the ribbon in the context of a document library. Assign a custom action to execute when the button is clicked. Obtain the selected item from the document library. Open a mail message containing a description (subject) and the unique url. Finally, make the button context ‘aware’, so that it is only enabled when a document is selected. So, let us start with the first part, add a button to click. The ribbon is composed using a XML definition that contains three logical parts: Tabs, Groups and Controls. These are hierarchical, meaning that Tabs contain Groups and Groups contain Controls. A tab (for example Documents) or group (for example New) can be static (always available) or contextual. 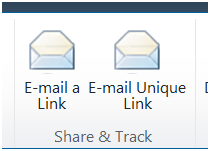 In our case, we want to add our button (control) to the Share & Track group on the Documents tab. This marks our Location, which we will see later when we start coding. To be exact, the location of our control will be Ribbon.Documents.Share.Controls, where Controls is the container of the group Share on the tab Documents that is located on the ribbon. Sounds logical enough right? Let’s start coding 😉 Open Visual Studio 2010 (this can also be done with VS 2008, but you must then build the package yourself. 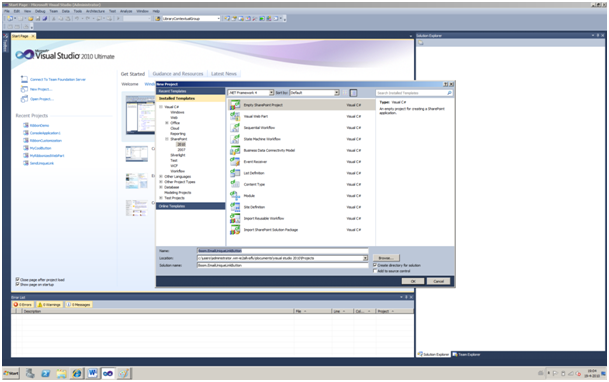 Visual Studio has far better build-in support for SharePoint 2010. 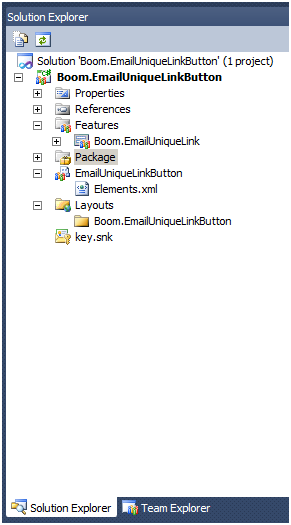 Create a new empty SharePoint project and give it a name, in my case I use Boom.EmailUniqueLinkButton. Enter the url of the site you want to debug to and use deploy as a farm solution option. Once done, right click the created project and add a new item to the project. Use the Empty Element type and give it a meaningful name, in my case EmailUniqueLinkButton. Id – This will uniquely identify our action, can be anything, but is usually something that could easily be related to the ribbon. Location – This indicates where we want to add our custom action, in our case to the CommandUI.Ribbon. Mark though that this is not yet the location of our button! That will follow later. RegistrationType – Although marked in the documentation as optional, it is not. RegistrationType indicates the type to which this action is bound. Could be List, FileType, ContentType or ProgId. In out case, it is List. RegistrationId – Although marked in the documentation as optional, it is not. RegistrationId indicates the type id to which this action is bound. In our case the list type id (101 = Document Library). In case it was a content type, this would contain the content type id. Below the CustomAction element, we can define a CommandUIExtension, which contains a CommandUIDefinitions and CommandUIHandlers. The former specifies what will be added, the latter specifies what happens when the control is used (in our case clicked). Include a CommandUIDefinition node below CommandUIDefinitions. Add an attribute Location. The location will dictate where the control will be added. In our case, Ribbon.Documents.Share.Controls._children. 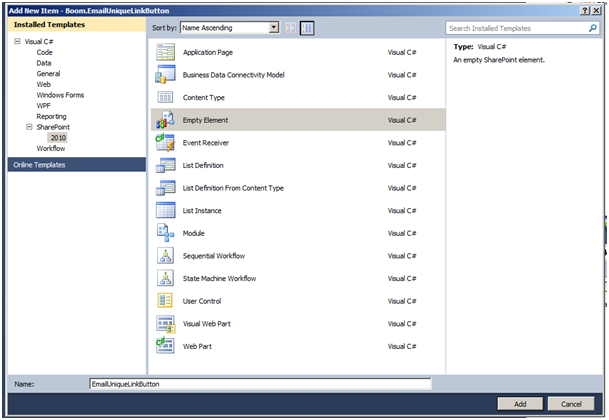 Note the ‘_children’ behind Controls, which indicates to SharePoint that a new child should be added to the Controls collection. Now, finally we can add our button. Include the following xml beneath the CommandUIDefinition node. Description="Sends the unique link to the document by email"
ToolTipDescription="Sends the unique link to the document by e-mail"
Before we get to the attributes, I wanted to reuse the image that was used for the original E-mail button. Partly because it would save me work, but more over because I am terrible in creating images and icons 😉 Secondly, I needed to check the Sequence, which defines the order in which the controls are displayed on the ribbon. As I wanted my new button to appear next to the original one, the sequence should be higher than the first, but lower than the following control. To check this, we can take a look at the default Ribbon definition located at 14\Template\Global\XML\CMDUI.xml. Search for Ribbon.Documents.Share.Controls, which defines the controls in the group we want to add to. There you can find the original EmailItemLink button that is the basis of our control. Id – Marks the unique id of our control. Usually, the convention is to follow the location naming followed by a meaningful name of the control, in our case EmailUniqueLink. Sequence – The order in which the control should be shown. In our case 15. Command – The name of the command to execute. Again, could be anything, but has to be unique, which is why I again use the naming convention. ImageXX – The several image attributes define the images to use for both 16 px and 32 px and their locations. I used the same as the original one taken from the CMDUI.xml file. Description – Describes the control. LabelText – Defines what is shown beneath the button in the UI. ToolTipTitle/ToolTipDescription– Shows the title and description when hovering over the button. Now we have the button defined, but unless we define the action, it will do nothing. So, add the following xml snippet in the CommandUIHandlers section. Many of the internet examples cover the Silverlight or native side of the client object model. I will use the ECMAScript method to get the properties of the list item and use it to generate the mail message. // Delegate that is called when server operation is complete upon success. // Delegate that is called when server operation is completed with errors. // Method to enable/disable the e-mail unique button on the ribbon. When using the client object model, we always have to obtain the client context first. The client context contains the proxies that are used to connect to the server. Second thing we need to know is that the client object model works with batches. This means that we load the object we want returned in the context and then execute it first. Include the following code snippet in the EmailUniqueLink method. In this code snippet, we first obtain the client context and load the web. Then we use the SP.ListOperation.Selection object to get the current list. This will return the GUID of the list, which we then use to get the list reference through the web object. Please mark though that the web and list objects are not populated yet. We again use the Sp.ListOperation.Selection object to get the current selected item in the list, which will return an object containing an id property. Using that id, we can request the list item from the list. To have the list item populated and thus get our unique document id, we need to load it in the context and then execute the query. As said, this can only be done asynchronously. This is done by calling executeQueryAsync and pass the success and fail methods respectively. Another thing to note here is that we use this when we need to access the variable outside the method. Include the following snippet in the onQuerySucceeded method. // Request url by using the get_item method. It will return the Url field type, which has a Url property. // Request the name of the document. // Open a new e-mail in the default mail program. Once the asynchronous call is done, we can access the properties of the listitem by calling the get_item() method passing the name of the field you wish to return, in this case the ‘_dlc_DocIdUrl‘ that contains the unique link. Because that returns a SPFieldUrl type like object, we call get_url() to get the actual url. To complete the mail message, we also request the name of the file and then call the mailto: to open the message in an e-mail client. In this case, we requested the entire listitem object from the server. We can also specify which properties to return so we can limit bandwidth use and increase performance. The way to do this is by adding the desired properties as parameters in the load method of the context, in our case _dlc_DocIdUrl and FileLeafRef, like below snippet. I prefer to load the entire object during debugging, so I can inspect the entire object (using developer tools >IE7). // Request the list item from the server using the getItemById method. This will load all properties. // If needed, one could pre-request the fields to be loaded to preserve bandwidth. // load the item in the context for batch operation. //Execute the actual script on the server side. Specify delegates to handle the response. The failed body is not of much interest, although you could add code there to shown that it went wrong and why, as it gets the arguments containing the error passed. Add the following snippet to the failed method. // request number of selected items. // only return true is a single item is selected. That’s it, watch the fruit of all you hard labor. In this post, we covered quite some material, like customizing the ribbon and using the client object model to examine the selected list item. Hope you like it! You can download the entire VS solution from here. Leave a comment if you have a couple of minutes. Much appreciated!